I haven’t posted a lot about what’s going on in my Clean Eating Challenge. The good news is there’s not a whole lot to mention. Other than aside from the first few days of running around like a crazy person trying to find specific items for my meals, it’s not been all that different than the spells I have where we skip eating out and I make all of our family meals. I have taken my measurements, and within the first week I lost an inch and a half around my waistline. I have some “before” pictures to share, but I want to wait to post them with the “after” pictures. I found a resource called “The Daniel Plan” and I am really liking it (thanks Karen D.). It’s easy to follow and involves your whole lifestyle, including elements of faith, friendship, focus (brain training), food and fitness. The Daniel Plan (www.danielplan.com) was developed in part by Rick Warren, who you may be familiar with as the author of The Purpose Driven Life. The dietary part was developed by Dr. Daniel Amen and Dr. Mark Hyman. It focuses on clean eating, and it had a 40-day element to it, so I thought it was a perfect fit for this challenge. You eat a lot of whole foods, including nuts and seeds, beef, chicken and fish and plenty of vegetables. The best part is, other than feeling a bit overwhelmed the first couple of days with all the slicing and dicing, I’ve tried to keep it simple. I quickly figured out that making the meals from scratch took me a little longer to cook than just heating up something pre-packaged. I like having leftovers for lunch the next day or even another dinner if it’s just me. There’s nothing worse for me than when I’m hungry and there’s nothing quick for a meal if we’re on the go. I try to grab a handful of almonds if I’m really hungry. It takes the edge off the hunger enough I’m able to think straight and figure out what to cook. Planning ahead seems to be the key for me to stay on track eating healthy. As far as expense goes, I’m going to be honest and tell you that yes, it’s more expensive to eat this way. However, I look at it this way: if I’m healthier for eating right, it costs less money down the road in health expenses. I read the labels to find the closest things I can to what the recipes call for. If the organic version costs a lot more, I skip it. Maybe someday that will become a factor, but right now I feel that I’ve improved on poking more vegetables down. It is more expensive to eat at a restaurant when you’re trying to be conscientious, depending on the restaurant. Fast food is generally not an option if you’re trying to eat whole foods, and nicer restaurants usually mean meat/fish and veggie or a salad minus all the goodies. That being said, my biggest stumbling block is the weekend, when everybody’s running around and we can all be on different schedules. I’m glad there’s a “cheat” day built in. I know that technically it’s Sundays that don’t count as part of Lent, but I used Saturday instead this past weekend. I ran a St. Patrick’s Day 7K with my friend Amy and my daughter, Erin, in the morning, and we hung around after the race for the parade. The food options for me were not ideal—I ended up having “lunch” around 9:30 am—a ribeye sandwich where I only ate part of the bun. I skipped the chips, but I did have beer after the race, which I had not had since starting this Challenge. So overall, I’ve felt pretty good about my adherence to the Clean Eating. I’m probably clean eating around 90% of the time, especially now since the first ten days of “detox” are over (no gluten, no dairy during the first ten days). The pictures above is what we had for dinner last night. 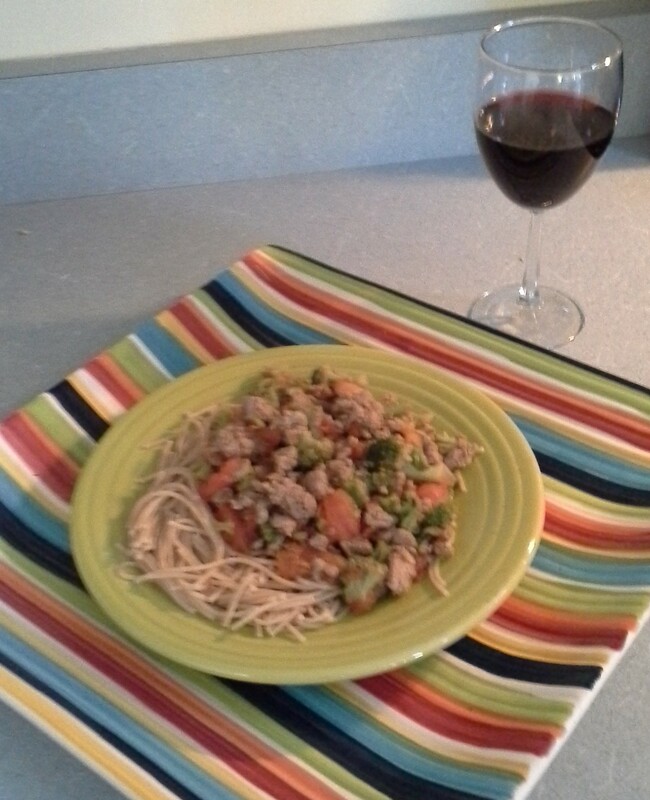 It was ground turkey and broccoli pasta. Fairly quick to make (under half an hour) and very good. 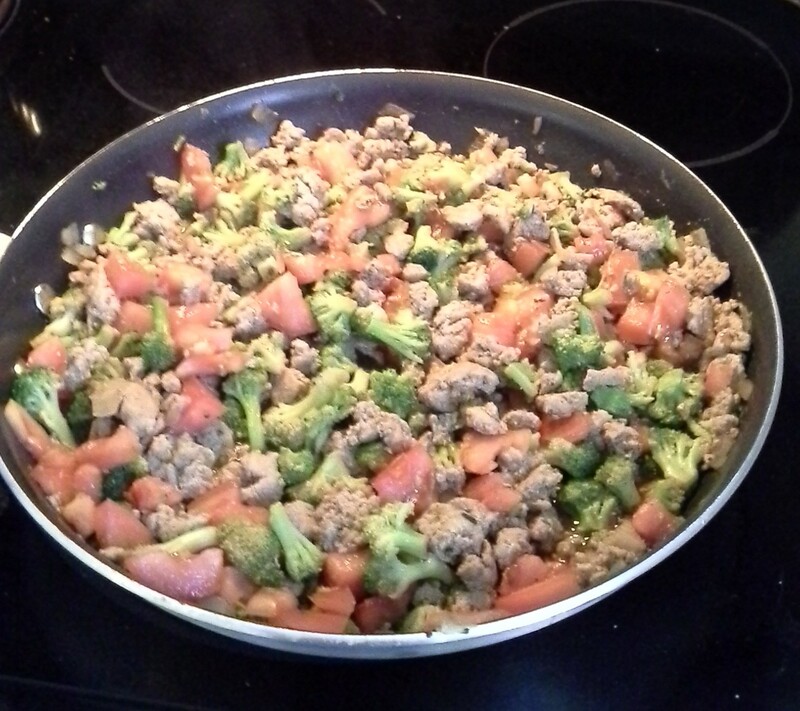 It only had ground turkey, onions, broccoli, tomatoes, soy sauce, mustard, salt and pepper in it, so it wasn’t one of those recipes where you have a ton of ingredients. The pasta was whole wheat—you can use gluten free, but neither Darrell nor I seem to have a problem with gluten, so I just opted for the whole wheat. Yum! Yummy dinner!!! Loving your blog, Amy!!! Thanks, Syndee. I’ve found it a great way to get all my “talking” out. Hahaha! Looks good enough to eat! I’m sure I’d have lots of veggie “leftovers” w/my kids…Kim’s Atkins diet is weird on vegies, too. Yeah, the kids look at me funny…I always just make sure they have their little carrots at least so they have some kind of veggie. They try to convince me that peaches or whatever fruit I might have is a vegetable so it should count the same. HA!